The Maine Supreme Judicial Court has rejected the appeal of a Houlton man convicted of murdering an Oakfield couple and then setting their home on fire nearly five years ago. AUGUSTA, Maine — The Maine Supreme Judicial Court on Aug. 13 rejected the appeal of a Houlton man convicted of murdering an Oakfield couple and then setting their home on fire nearly five years ago. Matthew Davis appealed his case to the Law Court in May. His defense attorney, Tina Heather Nadeau of Portland, argued that Aroostook County Superior Court Justice E. Allen Hunter erred when he denied a motion to exclude testimony from an eyewitness who identified convicted murderer Matthew Davis at the crime scene. She also argued that Hunter erred in denying Davis’ request to present expert testimony refuting the reliability of eyewitness testimony, and that there was insufficient evidence to support the convictions. The Law Court concluded that the lower court did not err by allowing the jury to consider the identification testimony because the witness’s identification was independently reliable. 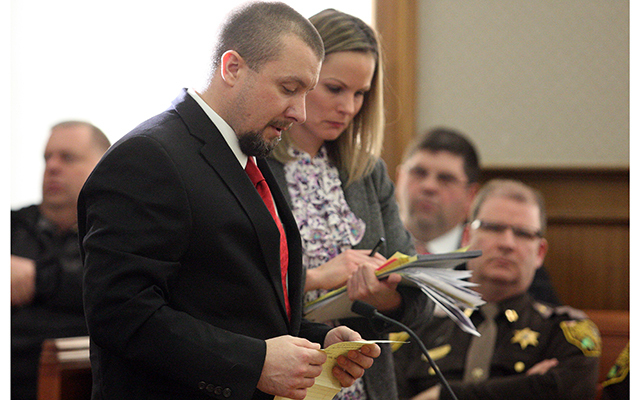 Assistant Attorney General Donald Macomber successfully argued that the murder conviction should be upheld. Hunter sentenced Davis, 37, to life in prison in February 2017 after he was convicted of shooting to death Michael Kitchen, 51, and Heidi Pratt, 49, in the early morning hours of Sept. 23, 2013, in the Oakfield home they shared. Police said he then set the house on fire and fled in a pickup truck he stole from the home. A jury also convicted Davis of four counts of arson, three counts of theft and one count of aggravated criminal mischief related to a crime spree he went on the day of the killings. Davis was represented at trial by defense attorney Daniel Lilley of Portland, who has since died, and Attorney Amber Tucker of Portland. Nadeau claimed in May that Hunter should have excluded an eyewitness identification of Davis by William Lloyd, a neighbor of the murder victims. Lloyd testified at trial that he was awakened about 4 a.m. on the day of the murders by the sound of gunshots. He testified that he saw a man with dark hair in a buzz cut with wide eyes drive Kitchen’s truck out of the couple’s garage through the closed door but that he did not recognize him that morning. The police never showed a photograph of Davis to Lloyd, but he said he saw a booking photograph of Davis following his arrest that was published on the Bangor Daily News Facebook page the day after the murders. When a state police detective came to Lloyd’s house to show him a photo array the next morning, Lloyd told him he’d seen the social media photo of Lloyd and was “100 percent certain” that the person he had seen in the photograph was the person he had seen the day before in the truck. He knew Davis from a motorcycle class they had taken together years before, but told police he had not immediately recognized him in the truck because Davis’ hair was long when he last saw him. Writing for the majority, Justice Ellen Gorman wrote that to have the testimony excluded, Davis was required to prove by a preponderance of the evidence that Lloyd’s identification of him was orchestrated by “improper state conduct.” The Law Court did not find that the state acted improperly.